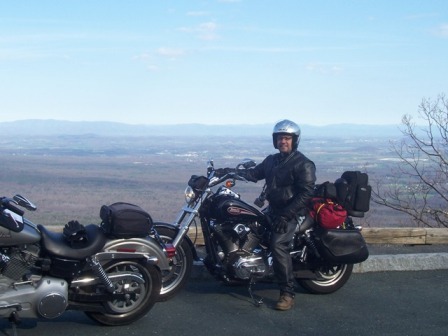 Our sponsor, Riders Discount, supplied me with an HJC SY-MAX 2 modular helmet to review last winter. I liked it so much I asked them to send me the IS-33 which is a three quarter helmet with similar features. By similar features, I mostly mean the integrated sunshield. Both helmets also feature removable washable SilverCool™ cheek and crown liners. Both come in a great selection of colors, I got silver. One of my reasons for interest in these helmets is the snug fit. I shave my head and my Harley-Davidson Jet II size medium fits a little loose. If I wear it with my windshield I get blurred vision and headaches from helmet wobble. The HJC helmets fit so snug the cheek pads squish my face a little and make me look like a fish. This size medium is just a tad too snug but as I wear it more the cushioning seems to fit my head better each time. My windshield still creates helmet wobble so I prefer to ride without the windshield. Problem with riding without the windshield is air and crosswinds blow up into the face shield. I notice it more with the IS-33 than the Jet. The one air vent in my Jet does not work at all. The two air vents in the IS-33 work better. I love having the integrated sunshield. It doesn’t rattle like it does in my SY-MAX. I don’t like to wear sunglasses but if I’m riding into the sun I can easily deploy the sun screen. Once the sun glare is no longer a problem I tap on the spring loaded button and it retracts back into the helmet. Another feature the IS-33 has that the jet does not is speaker pockets. It’s easy to put a set of speakers behind the pockets which are part of the cheek pads. Actually it is extremely easy to install any type of headset because the crown and cheek pads are removable. They snap in and out. Bottom line with a helmet is it has to fit comfortably before anything else matters so I recommend you try them on before buying. Assuming this helmet fit you, it is an excellent helmet. The modern high tech design makes me feel a little like a science fiction character… can you say Mighty Morphin Power Ranger? 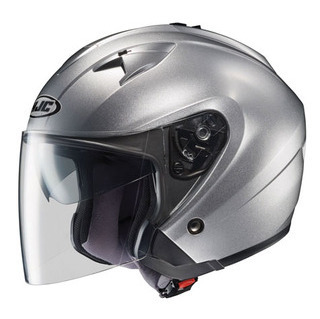 For more information about this helmet click here. I dig this helmet because is has a retro look with cool features, like the stormtrooper blast sheild you talked about. Having the pads and stuff makes it nice too. If you put on a terrorist gear or sweatshirt hoods you can take the pads out so that it doesn’t squeeze your brain out of your ear holes. I also like those Scorpion brain buckets…only they look too much like a galactic marine helmet from Starship Troopers for me. Oh yeah! Nice carpet bro! Glad you like the carpet. I chose it for it’s ability to hide pet fur and dirty paw prints. Diana just got one of those Scorpion Brain Buckets so she might indulge us with a product review at the end of the summer.